It’s almost St. Patrick’s Day, guys! St. Patrick’s Day means lots of people wearing green, talk of leprechauns, and people downing Shepherd’s Pie at Irish pubs. It also means every food blogger in the entire world is posting a recipe for their delicious version of a Shamrock Shake! I, incidentally, happen to be one of those food bloggers. So, what makes your shake so special, Alyssa? Why should we make your shake recipe instead of one of the 15 others we came across today? Good question, readers! Lucky for you, I have a very compelling answer! 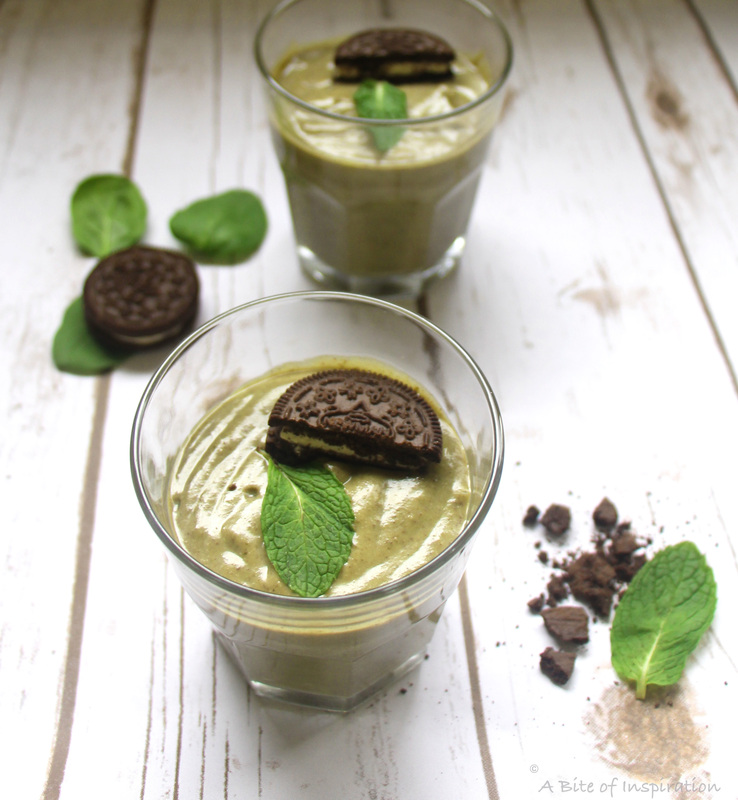 What makes my Healthy + Vegan Mint Chocolate Cookie Shake stand out from all the others is that it has healthy ingredients hidden inside it, but you would never know from tasting it! Yup, this shake has veggies in it! Now, you can have your sweets and eat your veggies too! What’s not to love? Regular Shamrock Shakes are laden with tons of sugar, artificial colors, artificial flavors, and so much dairy. My Healthy + Vegan Mint Chocolate Cookie Shake, on the other hand, has less sugar, no artificial colors, fresh mint, and no dairy. Plus, it has chocolate cookies blended right in! Yum! Those hidden veggies are your pot of gold if you have kids (or adults) who don’t like to eat their veggies. They’ll think they’re drinking just a regular, delicious shake, but it’s actually good for them. This vegan recipe uses absolutely NO DYE! That’s right, no yucky, artificial food coloring here, folks. Instead, this shake gets its pretty green color from fresh mint leaves, baby spinach, and avocado. But, don’t worry. You won’t taste any of the veggies in your shake, I promise. Ice cream and cookies are powerful flavors, guys. A little goes a long way. They cover up the veggie taste completely, but all the nutrition is still there. 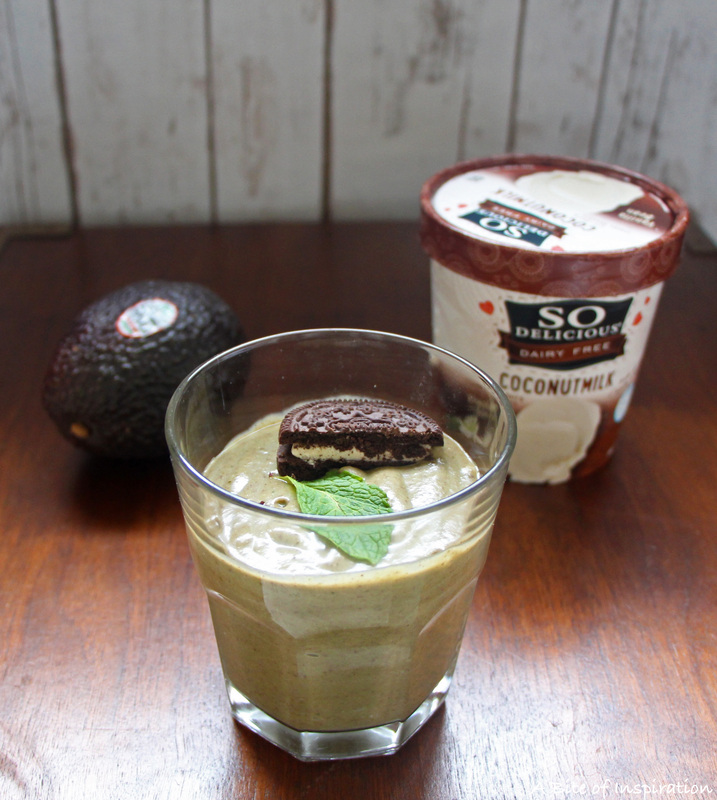 Who doesn’t love a recipe where you can have ice cream AND get your veggies too? Guys, it’s a St. Patrick’s Day miracle. 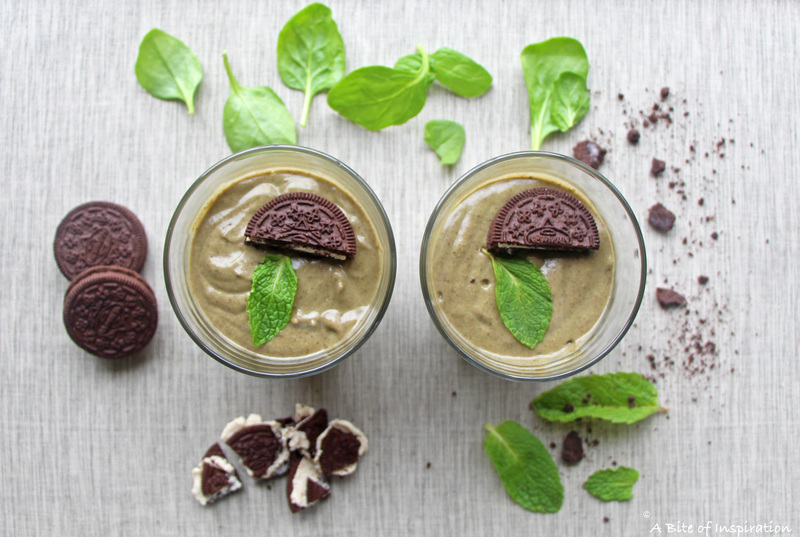 This Healthy + Vegan Mint Chocolate Cookie Shake is creamy, sweet, and refreshing with a perfect balance of mint to cookie. Using fresh mint leaves in place of peppermint extract adds a fresher taste to it, while adding a bit more natural green color. I use a little less ice cream in my shake than most others do to make it a bit lighter, but it still tastes the same because of the avocado! Believe it or not, the avocado adds a creaminess and thickness to the shake that makes it so that less ice cream is needed to produce that frothy texture! Who would have thought that avocado could replace ice cream? Another miracle! I use plain, unsweetened vegan milk for this because it really doesn’t need any more sugar in it. The cookies and ice cream are enough. As you can probably tell, I’m super excited about this recipe! I can FINALLY have my dessert and my veggies together (without tasting the veggies!) Best St. Patrick’s Day EVER! I’ve found my pot of gold at the end of the rainbow of Shamrock Shake recipes and I hope that this will be yours too! Enjoy! P.S. Make sure you use chocolate sandwich cookies that are vegan AND all-natural. I recommend Newman’s Own Newman-O’s, Crème Filled Chocolate Cookies . Pour into two glasses and garnish with cookies/mint leaves, if desired. Enjoy cold! If you want this recipe to be nut-free, make sure your vegan milk and ice cream don't contain any nuts. I used coconut milk and coconut vanilla ice cream for this recipe, but you can use soy, almond, etc. Whatever your preference is! 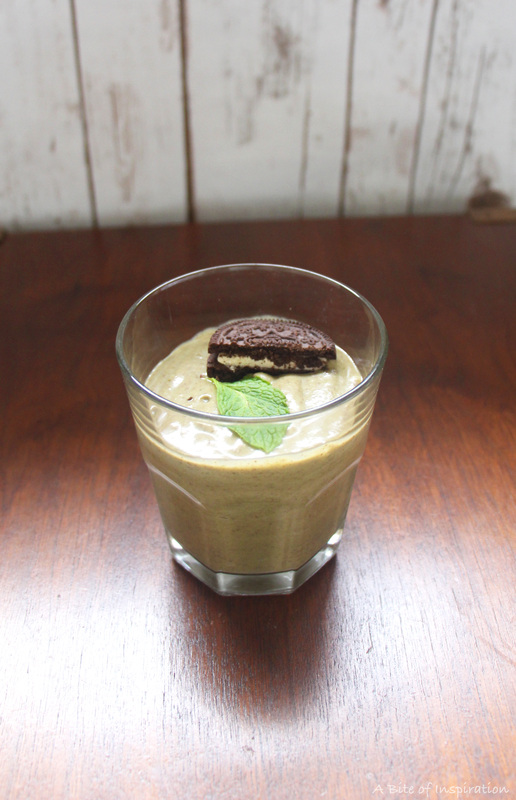 the spinach is a little scary, but agree that ice cream (and cookies!) are powerful things (i used to only take allergy medicine as a kid when the pill was buried under a mound of mint chocolate chip ice cream!). What a simple and deliciously satisfying treat! Can’t wait to try it!! This looks like the perfect way to celebrate St Patty’s Day. I love it!! I’ve never really gotten much into celebrating St. Patrick’s Day but this Mint Chocolate Shake I could definitely get into. Looks great! Cookie and cream and mint chocolate chip are my favorite flavors! Perfect dessert drink for st. patrick’s day! Thank you so much, Misa! They’re some of my favorite flavors too. Enjoy! I’m not much for St. Patrick’s Day, but I’m all about better versions of the ubiquitous shamrock shake! This looks tasty and festive! Love that it’s vegan. Slainte! I didn’t know you were part mad scientist:-) I cannot imagine how you came up with this but if you can’t taste the spinach you have revolutionized how to get kids to eat their spinach! Thanks for sharing this!! I appreciate having a healthy alternative to all those other shamrock shakes out there. I also like when ice creams/shakes use fresh mint instead of extract. It’s such a brighter, yet subtle, flavor that I really enjoy. 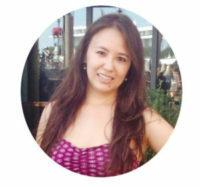 Thank you, Alison! I totally agree– fresh mint is way better. Hope you enjoy! Yay for grasshopper shakes!!! And I can’t believe you snuck some veggies into this smoothie! Definitely love that this is a healthier version of the St. Patrick’s day treat! Thank you so much, Joyce! This shake is definitely delicious anytime of the year. Enjoy!